When examining different residential roof repair options, most people are typically very quick to assume that the least expensive option is the one they want to use. After all, who wants to spend more money than they have to, right? This is a good idea to try and find a financially responsible option, but cost is not the only factor to consider. What about the ease of making the repairs, and how likely you will be to actually make them based on the system? Enter silicone roof coatings. When you have a leaking roof that needs to be repaired, silicone roof coatings are almost always the easiest option available. In most cases, all you have to do is remove the old, wet insulation (if there is any), but you can keep the rest of the insulation intact. Then, once you’ve removed the bad insulation, apply a silicone roof coating right over top of your entire residential roof. This will form a perfect seamless membrane that will block leaks from your roof for years to come. Could a roof repair really be this simple? The best part about silicone, though, isn’t even how easy it is to install. It’s the benefit of the product after the install that is so great. After you install the silicone roof coating and stop the leaks in your roof, you will rarely have to touch it again for 20 more years. If you do have to make repairs to the coating, all you need to do that is a razor blade, a rag to clean the roof surface, and some caulk or leftover coating from the installation. 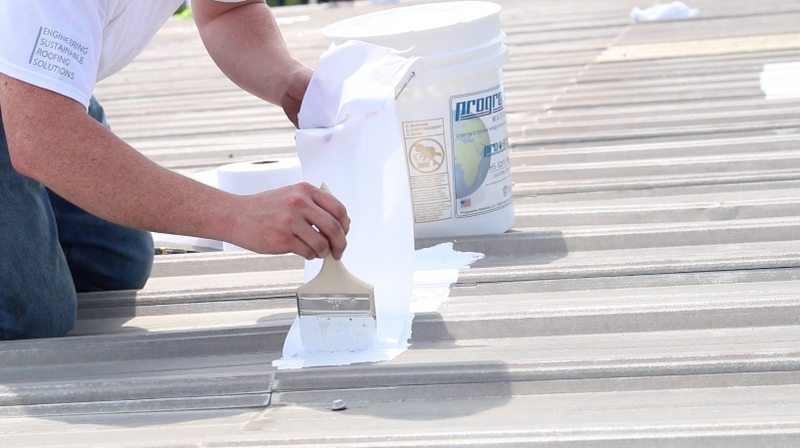 You also don’t need any specialized tools or equipment to install a silicone roof coating on your roof. If you’ve ever painted a wall or even simply seen it done, you probably have the skills required to install a silicone coating on your home. Finding a system that is inexpensive and easy to make your residential roof repairs isn’t hard. Silicone Coatings are one of the most simple and practical ways you can improve your roof, and oftentimes they carry the lowest price tag of all options available.